TORONTO -- The Toronto Blue Jays claimed right-handed pitcher Oliver Drake off waivers from the Tampa Bay Rays on Monday. Right-hander Mark Leiter Jr. was designated for assignment in the corresponding roster move. 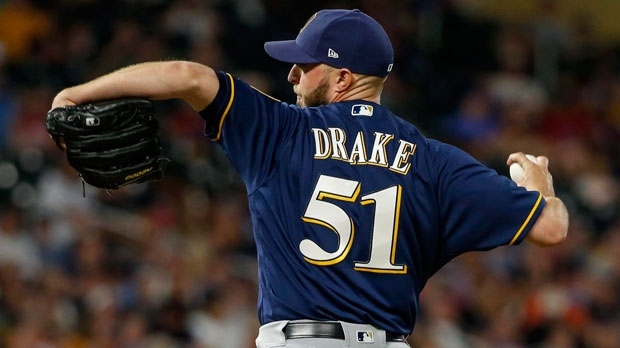 Drake briefly pitched for the Blue Jays last season, allowing four hits, three runs and striking out two over 1 2/3 innings through two games in late July. The 33-year-old from Massachusetts also pitched for the Brewers, Indians, Angels and Twins in 2018 and had a 5.29 earned-run average with 51 strikeouts and 17 walks. Tampa Bay claimed Drake off waivers from Minnesota earlier this month. Leiter Jr., a September call-up, pitched 6 2/3 innings for the Blue Jays in 2018, allowing 11 runs (10 earned) with four walks and nine strikeouts.